Once I had the keys to my car I was set! A beautiful little Silver Chevrolet, automatic, whatever the name, mini beast! With the latest pop tunes pumping I was onto the motorway heading towards my first mission of the day, a US SIM card! This mission proved more painful than I anticipated. Verizon apparently only issues SIM cards to ‘Verizon specific iPhones’, whatever they are. They suggested AT&T who presented their own hurdles for non US citizens wanting data connection. To cut an hour long experience short, with the kindest salespeople of all time I should add, I had to pay a $500 deposit, which I’ll get back in 12 months in the form of a cheque to a US only address. This was just the beginning. Following that the cheapest plans were only offered to Android, again, what the? So for me, a non US citizen iPhone user who wants some kind of data plan, I got stung with an $85 per month (before tax) plan plus an additional $36 connection fee. I was dumbfounded but left with little options if I hope to somehow continue this blog and maintain some contact with the outside world. Most of the sales reps overheard the chatter and were fascinated and horrified about what I was planning to do. Nevertheless they plan to follow the blog intently! 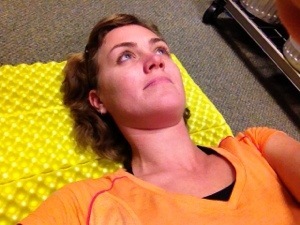 The next stop was REI where I was ready for a lie down to test out the various sleeping mats on offer. The Therm-a-Rest Z Lite Sol Sleeping Pad was a clear winner with it’s unique Z fold design and egg-carton pattern. I also purchased an Arcteryx synthetic jacket for the cold and a belt (plus the membership fee of $20). 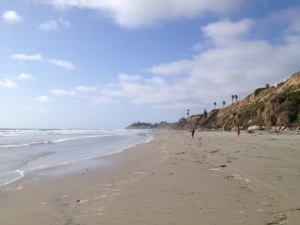 After a horrifically expensive afternoon I welcomed a walk along the beach and some quick site seeing. I tried to find HEET fuel for my stove and started to think Yogi was making the stuff up as no one knew what the hell I was talking about. 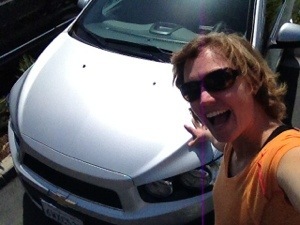 Then after talking to Donna I realised that HEET is an antifreeze liquid for cars, and in San Diego cars don’t freeze! So no wonder I received so many blank looks at gas stations! How many times am I going to write about my shoes you ask? Well it has to be said that I’ve finally reached a level of satisfaction in my shoe choice well above any other piece of gear or preparation so far. Thanks to the Outdoor Gear Store on St Kilda Rd in Melbourne (they really deserve this free plug), I’ve now got two pairs of shoes that I feel very confident in taking on the trail, for the small price of $120. 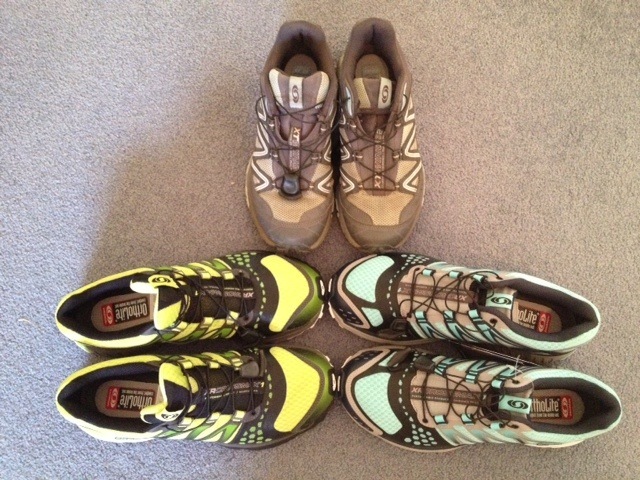 I’ll be taking the two bottom pairs on the PCT starting with the green pair. The pair pictured at the top above was the initial pair my parents picked up for me, and although it’s a great shoe, I needed a full size larger bumping me up from my original UK size 5, Euro 38 to UK 7.5, Euro 41. It seems extreme but I think my feet must have simply grown and will further expand with the heat and excessive use. Both shoes are Saloman XR Crossmax but the green pair is the ‘Neutral‘ style (flatter) and the blue pair is the ‘Guidance‘ style (slightly bigger arch providing more support). The first green pair I bought started to fray a little so they gave me a brand new pair when I went in for the second time to purchase the blue shoes which only cost me $50. I was blown away. It’s the only piece of gear I’ve managed to save any money on! Now the only question lingering is will two pairs be enough? I finally received my backpack, pack cover and sleeping bag yesterday from ULA. 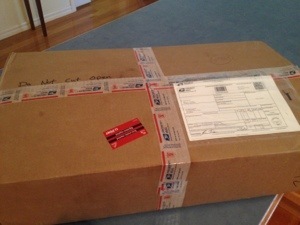 The ladies at the postoffice know me by name now and curiously handed me the large but light box with my gear inside. I carefully opened the box, without scissors this time (I almost put a hole in my tent) and took out the contents one by one. The sleeping bag is black despite the shiny silver version on the website, the pack cover blue, and my Catalyst the traditional green. The backpack was packed flat at the bottom of the box and was so stiff I thought there had to be a piece of cardboard inside holding its shape. When I looked inside I realised the stiffness was actually two pieces of foam inside the back panel, which after searching a few forums discovered is in fact the frame. There are two mental stays (rods) in the foam to strengthen the frame and that’s basically it. What I didn’t like was the squareness of it all. 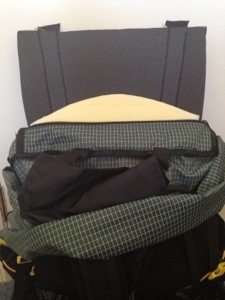 When I put the pack on I had this big wide flat bit above my head which seemed unnecessary. 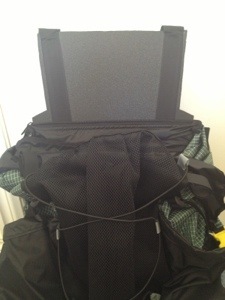 In a very non Rozanne fashion I took scissors to my brand new pack and trimmed the sides of the foam. It’s a small change but to me it’s made all the difference. With a little over a month until I head off to Vancouver, Sarah advised I should get myself a second pair of shoes to start wearing in. Sarah only went through two pairs of shoes on her 2004 PCT hike, however I’ve heard different accounts from people going through 6-8 pairs over the 5 months. Today I went to the store where I purchased my first pair of Salomons online and actually tried on a different pair this time, another full size bigger than the ones I have. The guy in the store wasn’t able to articulate what the major difference between the two shoes is, however for me the obvious advantages are the bigger size (UK 7.5 Vs UK 6.5), more toe room, seems slightly lighter and more breathable, and I’ll blend in when hiking through fluorescent grass and shrubbery. I also went back to Krapmandu yesterday to spend the $170 odd I still had of store credit. I bought the most lame and inconsequential items I could, knowing that the quality and price are both questionable at best. 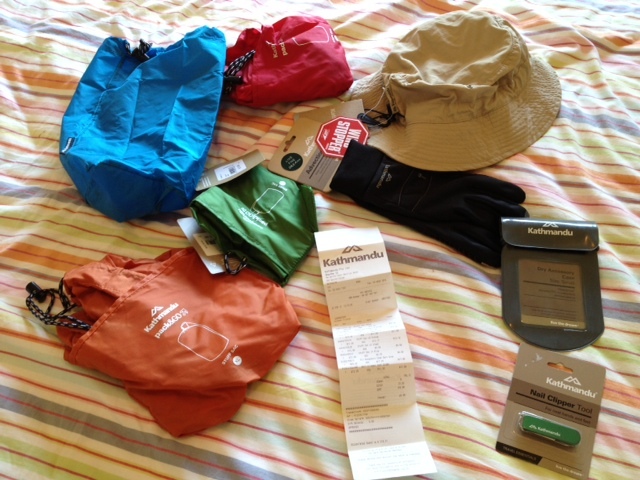 Even with a 40% discount for being a Summit Club member I spent $145 on an ugly bucket hat, four stuff sacks of varying colour and size, wind and water resistant gloves, a nail clipper tool with a few extra gadgets and a waterproof passport holder. $145 with a 40% discount!!! The guy at the store was super nice though, I went in like a woman on a mission with a long list and a ‘let’s make this quick and painless attitude’. I still have $28.35 to spend there, perhaps on another stuff sack should I require it. 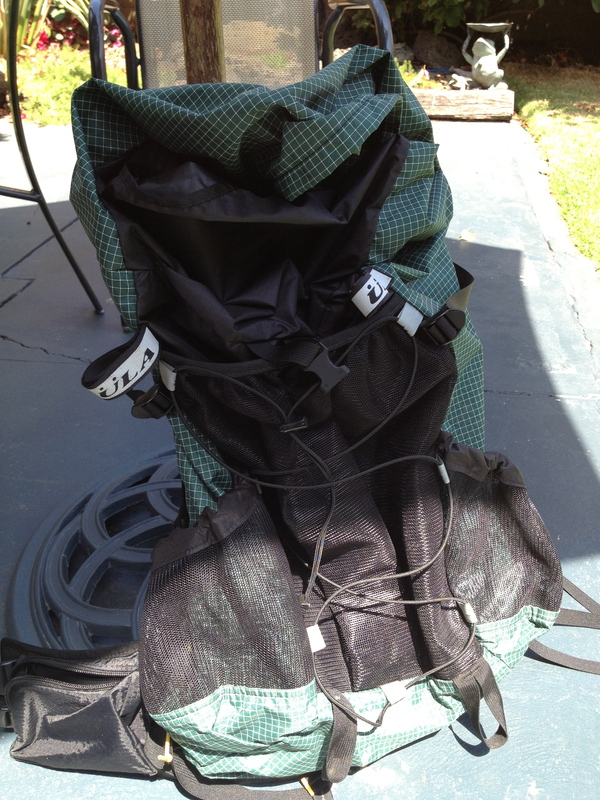 And last but not least I got a full refund on my Aarn backpack – thank you Ben! My new backpack is waiting for me at the postoffice but sadly I have to wait until Monday to collect it!! A few things came together for me on Friday. Firstly I picked up my visa from the post office, delighted at the fact it’s valid for 10 years with multiple entries. Whether or not this is the norm I’m yet to look into. It doesn’t mean I can stay in the US for 10 years, the length of each stay is determined by the customs officer on arrival, usually a maximum of 6 months at a time. 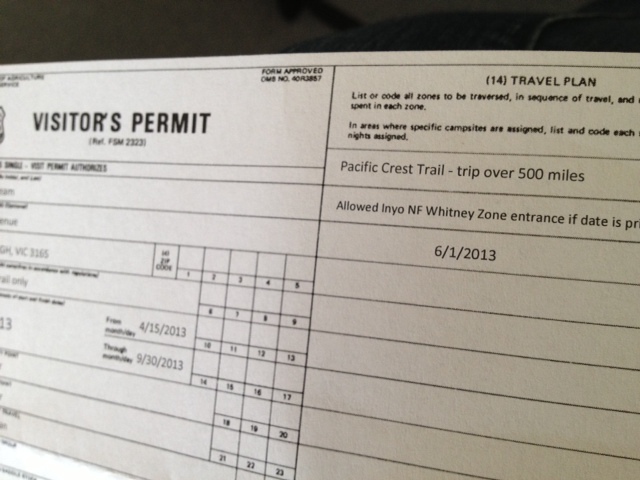 Perfect for PCT hiking! I also received a phone call from Ben at the backpacking store telling me he’s happy to give me a full refund on the backpack I returned last week (despite the painful conversation I had with his boss Tim a few days earlier). Big win! I also picked up my seam sealed tent from Franco who threw in an off cut of material I can use as a ground sheet under the tent. Perfect! And lastly I took the plunge and finally purchased my backpack. 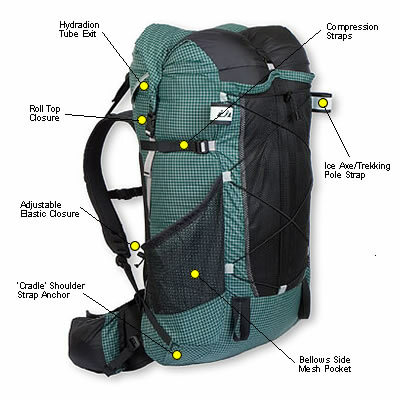 The first pack I intended to buy for the hike…. the ULA Catalyst. The only downside to this purchase was the shipping cost, although I bought a down sleeping bag for $130 with the bag saving myself the shipping cost about 3 times over. I can hear Tim’s argument about the Australian economy and his ultimate disgust in me purchasing online from the US. I’m sorry Tim, if you sold the Catalyst I would have bought it from you! 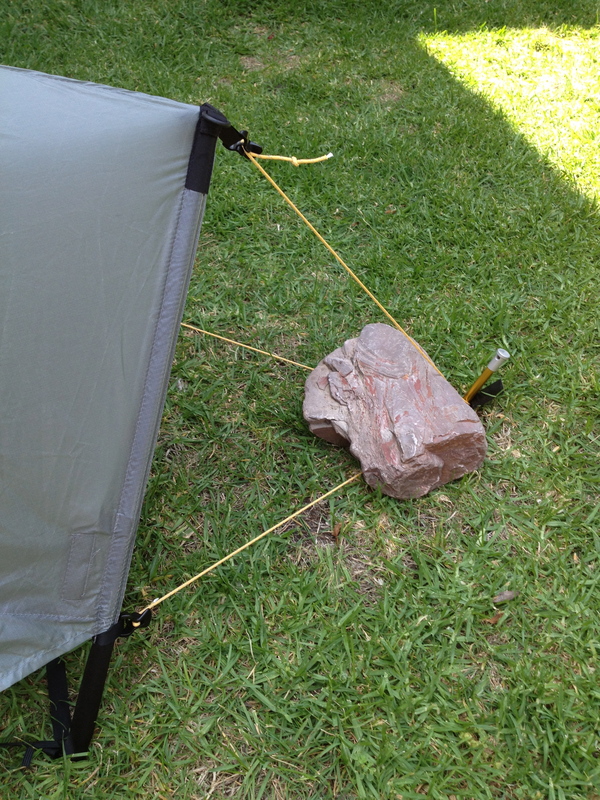 Today I took my beloved tent to be seam sealed by Franco from Tarptent. In addition to a personal setup demo, Franco also shared some of his hiking know-how from years exploring trails all over the world including some sections of the PCT. I was madly typing notes on my iPhone as he spoke, realising how little I know about snow, bears, tents, stoves, tying knots, and long distance hiking in general. His knowledge inspired and frightened me. Part of the reason I’m not going to the kick off weekend is to get a head start of the pack, but also to avoid the mania of gear talk, snow hype and hundreds of seasoned hikers sharing seasoned hiker wisdom. – Stove: – uses 55ml of alcohol (metho) a day. Caldera Cone from Trail Design. Get a Caddy with it (no idea what this is) and a side winder? 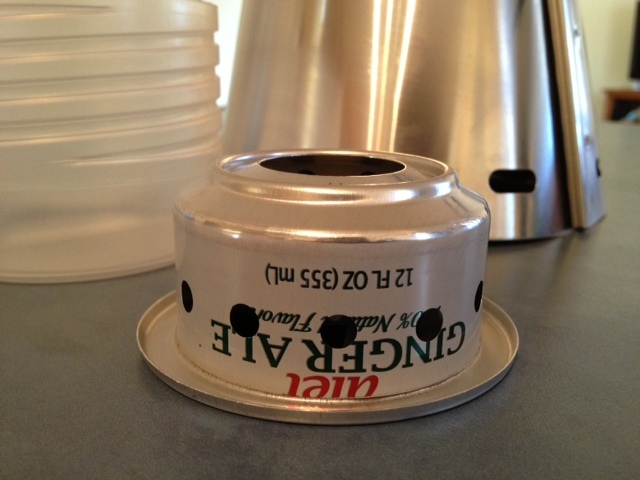 He also talked up the Neo Air sleeping mat, told me that baking soda doubles as toothpaste and mosquito bite ointment, and to add extra virgin olive oil to soup or hot chocolate for added calories. In addition to the 14 tents Franco owns, he also had a ULA Circuit backpack inside which I got to try on. I was surprised at how small it actually looked and decided that my gut instinct of buying the slightly bigger Catalyst version was right. I have since purchased the ULA Catalyst, pack cover and down sleeping bag from the ULA website this evening. Despite the insane shipping cost ($72.10) I’m feeling good about the purchase, especially since I saved $55 on the sleeping bag anyhow. 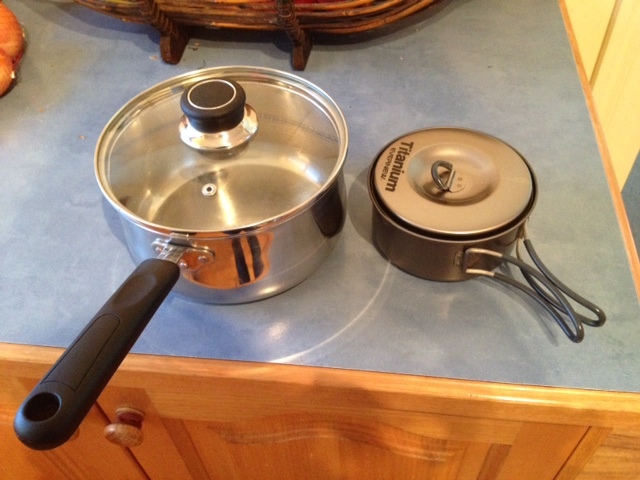 I now need to make some decisions on what cooking device I want to take. 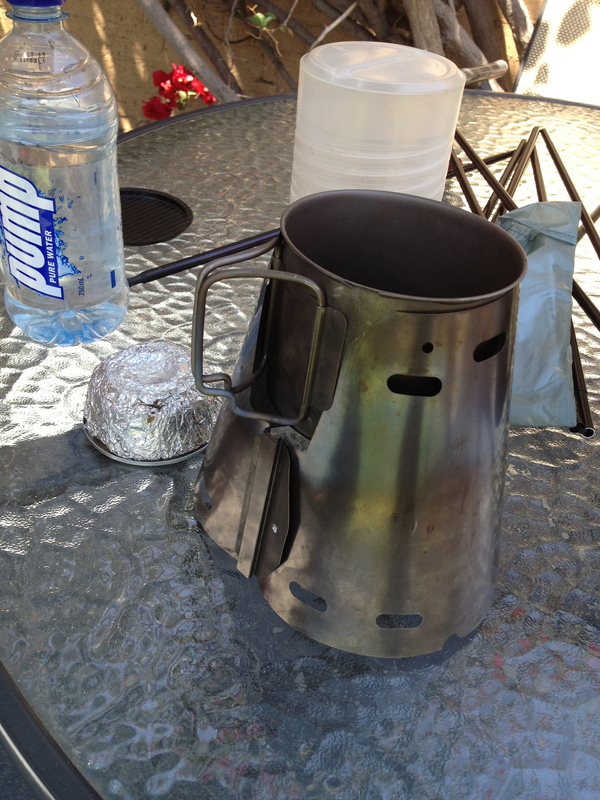 I told him I was considering a Jetboil, which he did in fact own, however he did recommend the Caldera Cone alcohol stoves. 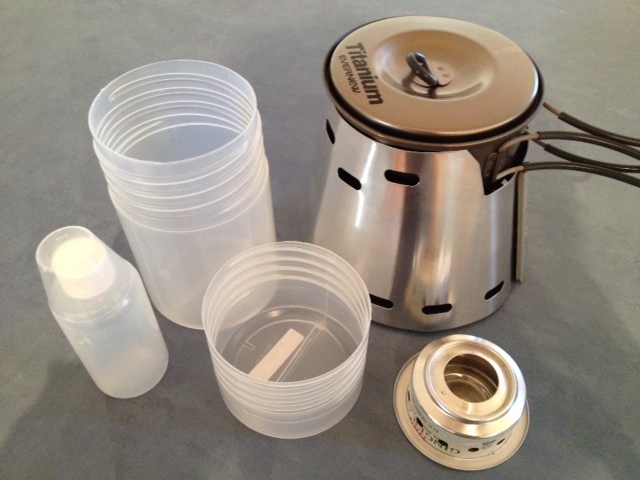 Apparently you save weight as you use up the fuel in contrast to the Jetboil. Mind you this comes from a man who knows how many grams 55ml of metho weighs, who only carries about a litre of water if he knows there’s a source close by and who uses chux wipes as a towel! 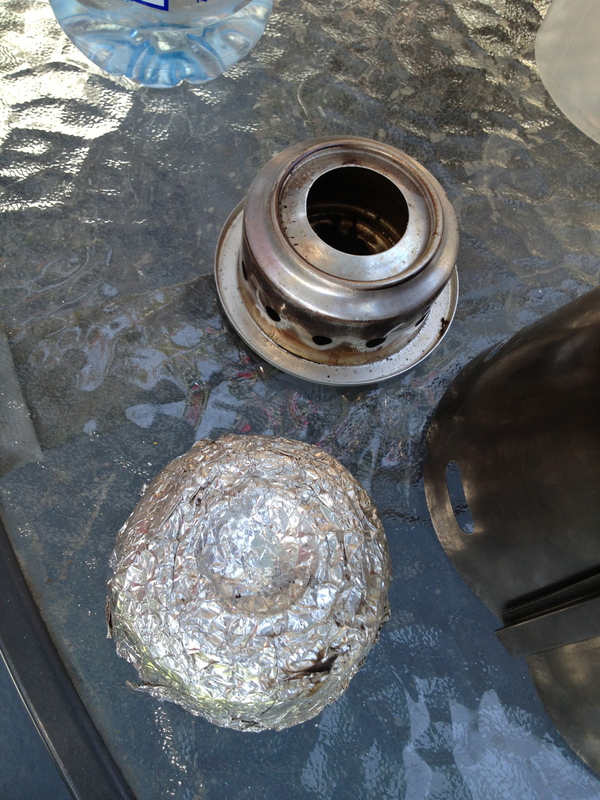 The homemade piece of foil is used to extinguish the flame and tip the excess fuel back into its bottle.